After washing, rinse the vehicle thoroughly with lukewarm or cold water. Do not allow soap to dry on the finish. Be careful when washing the side windows of your vehicle. Especailly, with high-pressure water.Water may leak through the windows and wet the interior. Do not use steel wool, abrasive cleaners, acid detergents or strong detergents containing high alkaline or caustic agents on chrome-plated or anodized aluminum parts. This may result in damage to the protective coating and cause discoloration or paint deterioration. The lower edges of the doors, rocker panels, and frame members have drain holes that should not be allowed to clog with dirt; trapped water in these areas can cause rusting. Avoid washing the wheels with highspeed vehicle wash brushes. Do not use any alkaline or acid detergents It may damage and corrode the aluminum or chrome wheels coated with a clear protective finish. By using the most advanced design and construction practices to combat corrosion, we produce vehicles of the highest quality. However, this is only part of the job. To achieve the long-term corrosion resistance your vehicle can deliver, the owner's cooperation and assistance is also required. Moisture creates the conditions in which corrosion is most likely to occur. For example, corrosion is accelerated by high humidity, particularly when temperatures are just above freezing. In such conditions, the corrosive material is kept in contact with the vehicle’s surface by moisture that evaporates slowly. When cleaning underneath the vehicle, give particular attention to the components under the fenders and other areas that are hidden from view. Do a thorough job; just dampening the accumulated mud rather than washing it away will accelerate corrosion rather than prevent it. Water under high pressure and steam are particularly effective in removing accumulated mud and corrosive materials. Don't park your vehicle in a damp, poorly ventilated garage. This creates a favorable environment for corrosion. Moisture can collect under the floor mats and carpeting and cause corrosion. Check under the mats periodically to be sure the carpeting is dry. Use particular care if you carry fertilizers, cleaning materials or chemicals in the vehicle. Prevent chemicals such as perfume, cosmetic oil, sun cream, hand cleaner, and air freshener from contacting the interior parts because they may cause damage or discoloration. If they do contact the interior parts, wipe them off immediately. 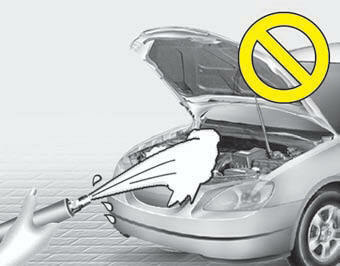 If necessary, use a vinyl cleaner, see product instructions for correct usage.